LinkedIn is helping soon-to-be grads from around the country tap into their professional community—whether they realize they have one already or not. Trying to land your dream career out of the gate is a tall order. But here’s the good news: There are roughly 11 million job openings per month in America at any given time. Sure, you don’t want all those jobs, but you want some of them—and some of them want you! LinkedIn connects qualified candidates with companies and organizations that crave top talent. With these tips, you’ll be well on your way to snagging a seat at the professional table before graduation. 80% of LinkedIn members consider professional networking to be important to new job opportunities and career success, according to LinkedIn research. With 530+ million professionals in the LinkedIn community, there is no other place where you can access such a wide range of knowledge, skills and resources to help you reach your goals. Searching for careers can seem like a daunting task. More than a quarter of professionals say they have no time to search for new job opportunities. But worry not, with search alerts you can get notifications and updates to a saved search via email or shared with you on LinkedIn. Use advanced search filters to narrow down opportunities by industry, location, experience level and more. Once your filtered search is set, simply create the alert. Let recruiters know you’re open to new opportunities by simply flipping a switch on your LinkedIn profile. It’s called Open Candidates, and yes, it’s that easy. Open Candidates is accessible from the “Preferences” tab on the LinkedIn Jobs home page. By flipping the switch, you privately signal to recruiters that you’re interested in new opportunities. Don’t forget to update your career interests. This helps you appear in the search results that recruiters are regularly scouring. Additionally, this helps inform the daily job recommendations LinkedIn sends you and surfaces on the jobs homepage. LinkedIn Salary has tapped into its network of more than 530 million members to give you deep salary insights into the compensation landscape. You can also dig deeper into compensation insights about specific companies you’re interested in so when the time comes to talk money, you’re ready. One of the easiest ways for students and alumni to make connections is through the LinkedIn Alumni tool. It’s an easy way to explore your alumni network for people who graduated from your same school, where they work now and in what cities. Simply search for your school and select “see alumni” to get started. You can access career paths for more than 23,000 colleges and universities worldwide. 80% of freelancers do not actually have any concern about their freelance work being replaced by technology, artificial intelligence, or automation in the next 10-20 years. 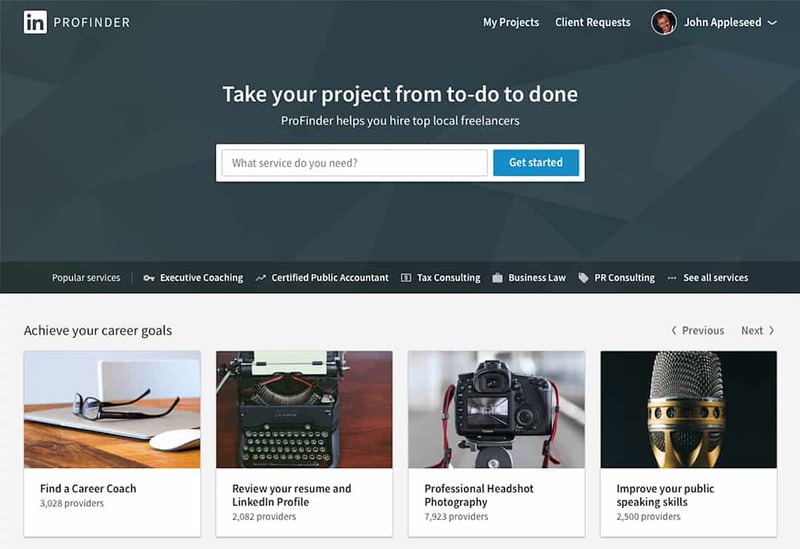 LinkedIn ProFinder started as an idea that has grown into a vibrant marketplace being used by more than 70,000 freelance professionals across the nation. LinkedIn has seen client demand surge with weekly requests for proposals growing more than fivefold in one year. LinkedIn launched Career Advice, a new feature that helps connect members across the LinkedIn network with one another for lightweight mentorship opportunities. Whether you need advice on your career path, switching to a new industry or best practices for a project you’re working on, Career Advice can help you find and connect with the right person who can help. Many people who are looking for work from home jobs use LinkedIn learning to gain the skills needed to be an ideal candidate for remote work. With LinkedIn Learning, you can now access a gigantic database of online courses on topics from coding and graphic design to public speaking. And here’s the best part: each course is typically sliced up into very manageable 5-10 minute learning chunks. Learning a new skill over the course of a week quickly becomes very achievable. Create or update your LinkedIn profile today. This provides other LinkedIn members with a better understanding of the unique skills, interests, and experience that make you — you. Make sure you have a profile photo – it will help get you recognized and connect to potential opportunities. Members with a profile photo receive up to 21x more profile views and 9x more connection requests. Bonus: Check out Resume Assistant, a new integration from Microsoft and LinkedIn that acts as a resume generator and helps you craft a compelling document directly within Microsoft Word.